The genus Kribbella consists of 15 species, with Kribbella flavida (Park et al. 1999) as the type species. The name Kribbella was formed from the acronym of the Korea Research Institute of Bioscience and Biotechnology, KRIBB. Strains of the various Kribbella species were originally isolated from soil, potato, alum slate mine, patinas of catacombs or from horse racecourses. Here we describe the features of K. flavida together with the complete genome sequence and annotation. In addition to the 5.3 Mbp genome of Nocardioides sp. JS614, this is only the second completed genome sequence of the family Nocardioidaceae. 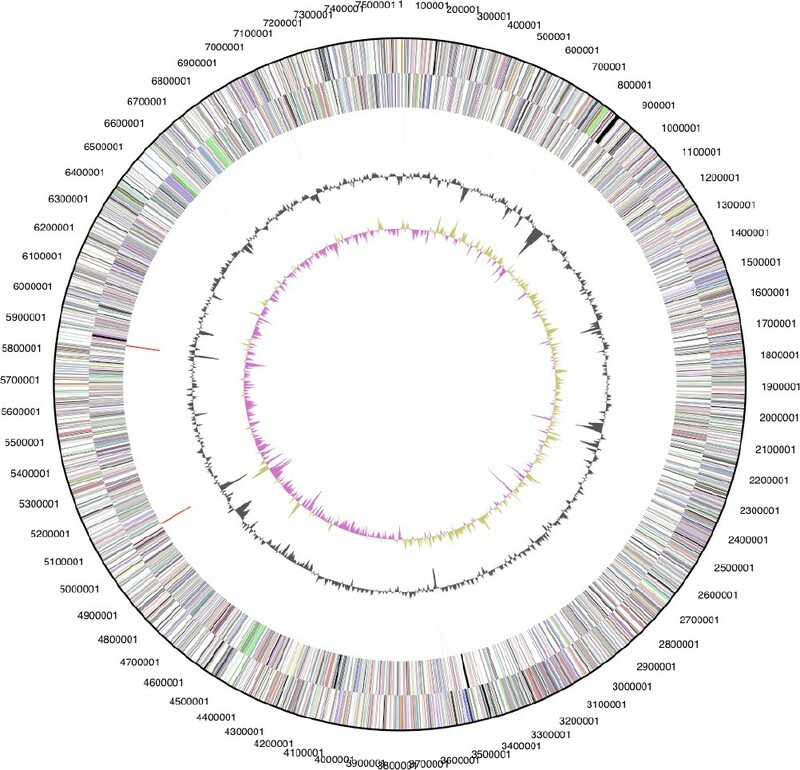 The 7,579,488 bp long genome with its 7,086 protein-coding and 60 RNA genes and is part of the Genomic Encyclopedia of Bacteria and Archaea project. Strain IFO 14399T (= DSM 17836 = KCTC 9580 = JCM 10339 = NBRC 14399) is the type strain the species Kribbella flavida, which is the type species of the genus Kribbella. Strain IFO 14399T was originally isolated from soil in China and first described as ‘Nocardioides fulvus’ by Ruan and Zhang, 1979 . In 1999, the strain was reclassified into the novel genus Kribbella on the basis of comparative chemotaxonomic and 16S rRNA sequence analysis . K. flavida exhibits mycelia on several media used for growing the strain. The mycelium consists of hyphae, which are extensively branched and penetrate into the agar medium. The hyphae often fragment into rod to coccus-like elements . Here we present a summary classification and a set of features for K. flavida IFO 14399T, together with the description of the complete genomic sequencing and annotation. The type strain IFO 14399T was isolated from soil in China. Genbank contains only one additional 16S rRNA gene sequence with at least 99% similarity, derived from a strain isolated from scabby potatoes (EU80972). No phylotypes from environmental samples or genomic surveys be directly linked to K. flavida, indicating rare occurrence of the species in so far screened habitats (October 2009). Figure 1 shows the phylogenetic neighborhood of K. flavida IFO 14399T in a 16S rRNA based tree. The sequence of the two 16S rRNA genes in the genome of strain 14399T differ by two nucleotides from each other and by up to two nucleotides from the previously published 16S rRNA sequence generated from KACC 20258 (AY253863). 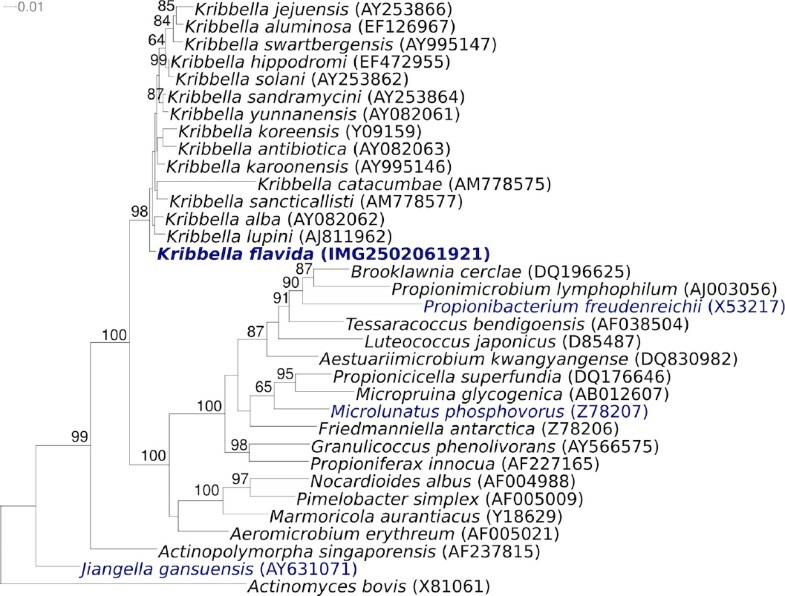 Tree highlighting the position of K. flavida IFO 14399T relative to the other type strains of the genus Kribbella and the type strains of the other genera within the families Nocardioidaceae and Propionibacteriaceae. The tree was inferred from 1,343 aligned characters [3,4] of the 16S rRNA gene sequence under the maximum likelihood criterion  and rooted in accordance with current taxonomy. The branches are scaled in terms of the expected number of substitutions per site. Numbers above branches are support values from 1,000 bootstrap replicates if larger than 60%. Lineages with type strain genome sequencing projects registered in GOLD  are shown in blue, published genomes in bold. 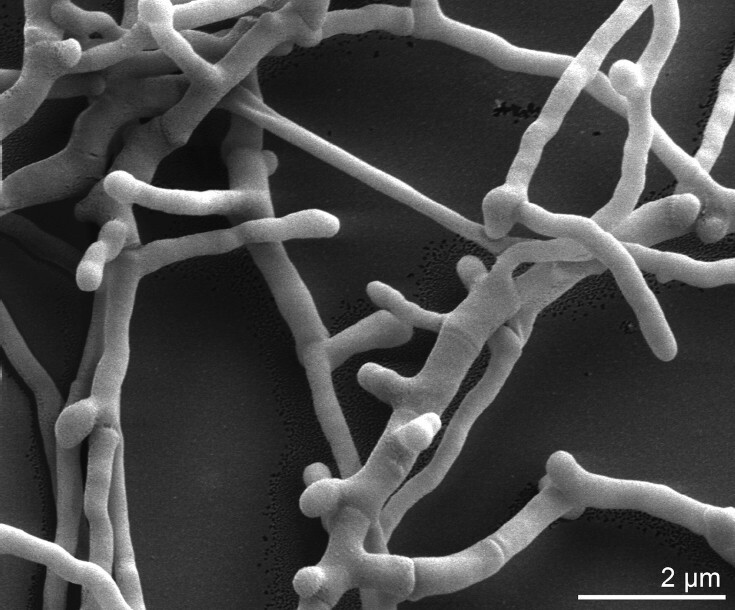 K. flavida is a Gram-positive, aerobic and non-acid-fast actinomycete (Table 1), characterized by primary mycelium (Figure 2), with branched hyphae that penetrate into the agar medium. Aerial mycelium is also developed and can break up into short to elongated rod-like elements. Growth occurs between pH 5 and 9 and between 20 and 37°C. The strain shows positive activity for catalase, oxidase and urease. It utilizes D-glucose, D-cellobiose, maltose, D-melibiose, sucrose, D-trehalose, melezitose, D-raffinose, adonitol, myo-inositol, D-mannitol, inulin, disodium succinate and disodium fumarate as sole carbon and energy source . One of the meaningful characteristics of the genus Kribbella is the presence of LL-diaminopimelic acid as the diagnostic diamino acid in the cell wall peptidoglycan . The predominant menaquinone is a tetrahydrogenated menaquinone with nine isoprenoid units MK-9(H4) . The major fatty acids detected in K. flavida are anteiso-C15:0 and iso-C16:0 . Phosphatidylcholine is the main polar lipid . The genus Kribbella differs from other LL-diaminopimelic acid and MK-9(H4) containing taxa, by having a typical hyphal morphology . K. flavida IFO 14399T, DSM 17836, was grown in DSM medium 830  at 28°C. DNA was isolated from 1–1.5 g of cell paste using Qiagen Genomic 500 DNA Kit (Qiagen, Hilden, Germany) following the manufacturer’s instructions with modification st/FT for cell lysis according to Wu et al. . The genome was sequenced using a combination of Sanger and 454 sequencing platforms. All general aspects of library construction and sequencing can be found on the JGI website. 454 Pyrosequencing reads were assembled using the Newbler assembler version 1.1.01.20 (Roche). Large Newbler contigs were broken into 8,548 overlapping fragments of 1,000 bp and entered into assembly as pseudo-reads. The sequences were assigned quality scores based on Newbler consensus q-scores with modifications to account for overlap redundancy and to adjust inflated q-scores. A hybrid 454/Sanger assembly was made using the parallel phrap assembler (High Performance Software, LLC). Possible mis-assemblies were corrected with Dupfinisher  or transposon bombing of bridging clones (Epicentre Biotechnologies, Madison, WI). Gaps between contigs were closed by editing in Consed, custom primer walk or PCR amplification. A total of 2,850 Sanger finishing reads were produced to close gaps, to resolve repetitive regions, and to raise the quality of the finished sequence. Illumina reads were used to improve the final consensus quality using an in-house developed tool (the Polisher). The error rate of the completed genome sequence is less than 1 in 100,000. Together all sequence types provided 51.2× coverage of the genome. The final assembly contains 59,008 Sanger and 433,053 pyrosequence reads. The genome is 7,579,488 bp long with a 70.6% GC content (Table 3 and Figure 3). Of the 7,146 genes predicted, 7,086 were protein-coding genes, and 60 RNAs; 143 pseudogenes were also identified. The majority of the protein-coding genes (70.7%) were assigned with a putative function while those remaining were annotated as hypothetical proteins. The distribution of genes into COGs functional categories is summarized in Table 4. We would like to gratefully acknowledge the help of Katja Steenblock for growing K. flavida cultures and Susanne Schneider for DNA extraction and quality analysis (both at DSMZ). This work was performed under the auspices of the US Department of Energy’s Office of Science, Biological and Environmental Research Program, and by the University of California, Lawrence Berkeley National Laboratory under contract No. DE-AC02-05CH11231, Lawrence Livermore National Laboratory under Contract No. DE-AC52-07NA27344, Los Alamos National Laboratory under contract No. DE-AC02-06NA25396, and Oak Ridge National Laboratory under contract DE-AC05-00OR22725, as well as German Research Foundation (DFG) INST 599/1-1 and SI 1352/1-2. Classification of Bacteria and Archaea in risk groups www.baua.de TRBA 466.